TalkingTGauge.net • View topic - dcc (again) tiny decoder. Re: dcc (again) tiny decoder. Visiting the lighting situation again in the ICE trains I spent an hour trying to trace the little circuit board which is so fiddly and given I have quite meaty multimeter probes it's pretty hard to figure out what's connected to what, it's a double sided board with at least one resistor on it, a three pin diode thing and a couple of other components. I've almost zero idea what they're *for* because two of the wires go straight through the board to the lighting board. Anyway, this is all digression. I detached the board from the led cluster and tried the pins with 3.3 V, leds lit up. Knowing that LEDs are diodes and have some reverse voltage resistance potential I ended up wiring them together in parallel, opposing each other. and run it up to 50% speed in JMRI which is fast as I ever intend to take these locos, it seems to keep them below 5V on the motors that way. If I can get my head and iron around stripping and soldering the enamelled wire I have then I should be able to get the light cluster back into the more beautiful loco I have running dcc I linked a few posts back. I'd have loved to get them onto the extra wires from the dcc controller which are switchable power sinks, but I have no consistent DC supply in these trains, it's ac on the red and black and the DC that hits the motor obviously turns off, flips polarity and changes. I think I might have murdered my raspberry pi though by stealing volts out of its headers, I expect I pulled too much current or something. I'm pretty bad at electronics when all's said and done. Anyhoo, thanks for reading. Any and all comments about what I'm up to are welcome. At a guess, the lighting unit circuit would be something like this... I also don't know if it uses a single bi-colour LED or two separate red and white ones. The first thing to try (if you haven't already) is just connecting the white and yellow wires directly to the lighting unit. If these outputs are both push-pull types (alas, never specified in the documentation), then everything should work properly. Unfortunately, if the 6-pin decoder is built the way I suspect it is (with open-collector outputs), then I cannot see any way of operating this type of lighting unit properly in bidirectional mode. Unless, of course, you are willing to seriously modify the lighting unit by isolating and completely separating each LED, and that only if there really are two separate LEDs. However, you can easily set up basic unidirectional lighting so that one of the LEDs works correctly - white on one power car and red on the other. 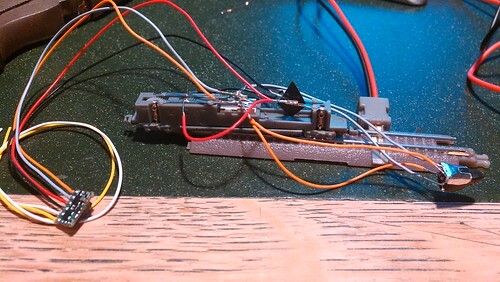 This simply involves connecting the yellow and black wires to the unit on one car, and white and black on the other, and swapping them around until you get the right combination. This will give you correct, steady head- and tail-lights when running in one direction, and no lights in the other. There really isn't room to do anything much with the lighting unit. I've also realised that the BR units I also want to run are on a 16M unit which has almost zero space for the decoder. I'm a bit dejected tonight. However I did manage to tin some enamelled wire and loom up the lighting unit for bonding to its little motor. lights do the right thing in each direction! I need to get the little panel back on the bottom of the nose to lightblank the spill from the red, but it's all on the inside! woo. Just a thought. If a train is going to be run as an EMU (permanently coupled) would it be possible to fit the electronics in an adjacent coach then thread the feed through with litz wire? (Fitting the coach with pick-up bogies). don't panic, in trying to get the wiring better seated for a closer shell fit so the slam panel would go on the nose perfectly i shorted something and evaporated two springs. I've been watching this thread with great interest....and I'm amazed at how you've been able to get so much into such a small space. There's got to be a dcc manufacturer looking at this....as I'm sure dcc will generate a lot of interest in the scale. What I really need is for CT to sponsor me, since I exclusively use that single decoder of theirs. There's actually LOADS of room in the ICE chassis if you have steady enough hands for the wiring. It's really ALL about the packaging on the wee boards. I wish I could afford the BR train and start figuring out how to get a board in that, I think it's going to need a dremel and some cleverness for that *that* guy. Whilst I'm bleating about things though, both coastal dcc and tguage.com have been awesome at posting me things quite quickly. And it can simple sit flat on the top of the motorised chassis where the electrical straps are.